Why You Should Remove A Dead Tooth? A tooth is deemed dead or “non-vital” when blood no longer flows to it. This usually is the result of trauma or tooth decay. Having a dying or dead tooth remain for too long in the mouth can lead to serious health concerns. This makes it important to treat a dead or dying tooth as soon as you realize you have one. Left untreated, the bacteria that thrives from the dead tooth will spread and besides the health implications, it may also lead to the loss of additional teeth. 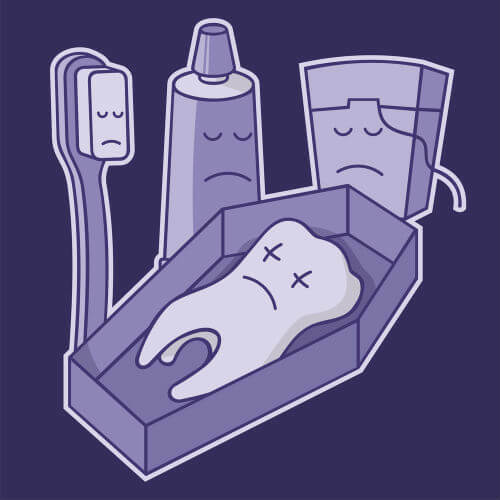 Even with the best of best dental hygiene and oral care, your tooth can still die. The first culprit is tooth cavities. A hard fall or sports injury can also cause your blood vessels to burst and cut off the blood supply going to your tooth. The nerves and other tissues will usually die because no blood is flowing to them. Once the dental pulp begins dying, bacteria will start feeding on the decaying tissue matter. The bacteria can thrive and cause intense pain in the hollowed tooth. Although it’s not always an easy thing figuring out if you have a dead tooth, you can still start by doing a self-diagnosis. The two main symptoms are changes in color (tooth discoloration) and pain. Of course, even when matched together, these two symptoms can be true of other dental implications. In this sense, only an orthodontist is in a position to determine the actual state of the tooth in question. If you are experiencing any form of discomfort or tooth pain, you should not delay but seek the help of a dentist. Often, a quick X-ray can reveal whether or not your tooth is dead. Although nobody wants to get their teeth extracted, it may become your only option if treatment is not sought soon enough. For many dead tooth situations, root canal therapy is considered the best solution. This entails cleaning out any decaying and dead tissue. A root canal saves your tooth without having it extracted. While it’s difficult and impossible to predict injuries or accidents to your tooth, there are many ways through which you can reduce the chances of your tooth dying such as good dental hygiene and oral health. In the first place, it’s more convenient, certainly less painful, to prevent a tooth from dying. A dying or dead tooth can lead to different levels of pain. Removing the dead or dying tooth and replacing it with an implant may turn out to be the only option if you want to have a tooth. However, implants run at great cost in North America. By simply looking at your tooth, it may not always be that easy to identify if it’s dead or dying. Only a dental professional can successfully diagnose it which makes regular trips to your dentist vital. On your part, daily dental care is an important step if you want to avoid the death of your teeth.